Are you really invisible or is that just a trick?" I love kids. I love the simplicity of their faith and the innocence in their belief. Their assumptions about God crack me up… but sometimes I honestly wonder if, as adults, our perceptions of God are really any better. It will no doubt take an eternity to understand Him! Dear God, I can’t hope to understand You with my limited mind. Thank You for revealing Yourself in a capacity I can comprehend, in a way that matters to my life. Thank You that I have eternity to get to understand You completely! Today, give me just one more little glimpse of who You really are. Amen. 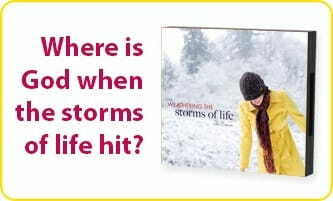 To thank you for helping even more listeners experience Life in Jesus Christ, we want to send you a CD copy of Jill’s message, Weathering the Storms of Life. Its encouraging teaching reminds you God is in control and has a plan for your life – no matter what suffering comes your way. So please request your copy of Weathering the Storms of Life as our thanks for your gift below, which will be doubled by the $100,000 Matching Grant. God bless you for your generosity!